Friendly Fire: How are short sales tracked? How are short sales tracked? If an investor believes the price of a stock is heading down, that investor can short the stock. Borrow shares from someone. This is usually performed by the investor’s brokerage firm. The brokerage firm finds shares that can be borrowed either from the brokerage firm’s own customers or from a different firm. Sell the borrowed shares. The investor sells the borrowed shares on the market. Wait for the share price to drop. The investor waits for the price of the stock to drop. Buy the shares back. Once the price has dropped the desired amount the investor buys back the number of shares he sold. Return borrowed shares. The investor returns the borrowed shares to their original owner. The investor profit is the difference between the price he sold and the price he bought the shares minus commissions. Most of the above steps would be performed by the investor’s brokerage firm. An investor instructs his firm to short a particular stock. The brokerage firm will handle the borrowing, selling, buying back, and returning of shares. The investor does not realize the gain until the short sale is closed out. In other words, the investor does not receive the cash when the borrowed shares our sold in the second step. The investor only receives cash once the entire short sale process is completed. What if the stock price goes up instead of down? When closing the short position the investor must pay the difference between the sell price and the buy price and will lose money on the short sale. Brokerage firms will usually require short investors to have some additional cash in their account to cover their short sale in case the price goes against the investor. Brokerage firms are required to report the number of shares being shorted. This information is reported to the exchange (NYSE of NASDAQ) and is made public. Most financial sites indicate the number of shares being shorted for a particular stock. 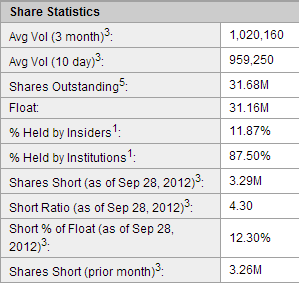 The image below from Yahoo finance shows 3.29 million shares of CMG were being shorted at the close of 9-28-2012. This is over 12% of the total outstanding shares of CMG. What is a naked short sale? A naked short sale is where the first step of a normal short sale is skipped. The brokerage firm does not borrow the shares. The brokerage firm goes to the market and says “I don’t have any shares of XYZ to sell at this very moment but I will obtain the shares to sell before the settlement date”. The settlement date is three (3) business days after the trade. Thus, the brokerage firm sells shares of XYZ without having the shares. This is naked short selling. The brokerage firm must borrow the shares before the settlement date three (3) days later in order to deliver the shares to the buyer. If the brokerage is unable to borrow shares to deliver before the settlement date the transaction is recorded as fails-to-deliver. No money or shares are exchanged since the brokerage is unable to deliver the shares that were agreed upon. A large amount of fails-to-deliver transactions for a stock usually indicates an excessive amount of naked shorting. When investors and brokerage firms start to aggressively short a stock they will do so without having borrowed the shares to sell. This will result in a large amount of naked short selling. When there are a large number of naked short sellers not all the sellers will be able to borrow the necessary shares before the settlement date and many fails-to-deliver transactions will be recorded. The SEC records the number of fails-to-deliver transactions. 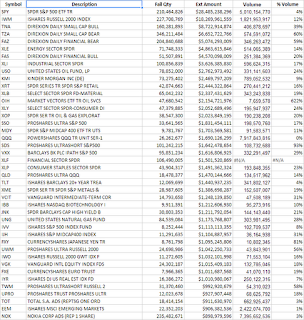 The tables below summarize the fails-to-deliver transactions from 1-1-2012 through 9-14-2012 (data obtained from here). The “Ext Amount” column shows the total dollar value of the transactions that failed ( i.e. Fail Qty * Share price ). 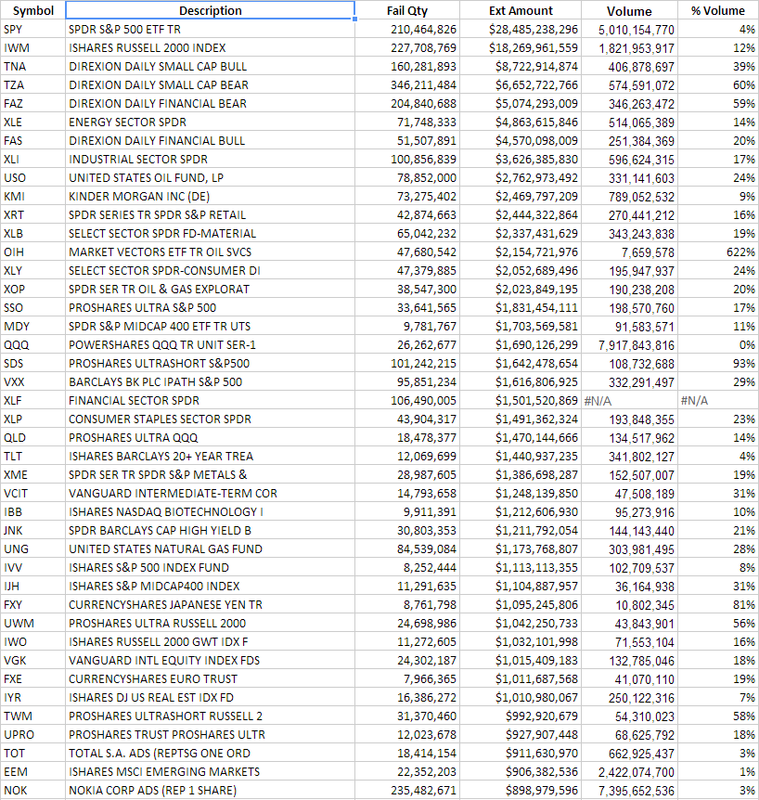 The “Volume” column is the total number of shares traded in the same time period. 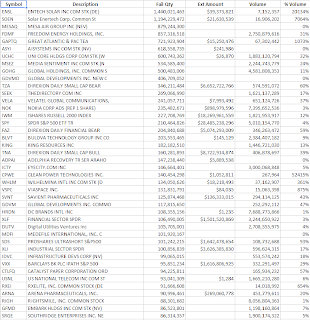 The “% Volume” shows the percentage of shares that failed to deliver as a percentage of the total market volume. The first table orders the data in descending order by the quantity of shares that were not delivered. Most of the companies at the top of the list no longer exist. 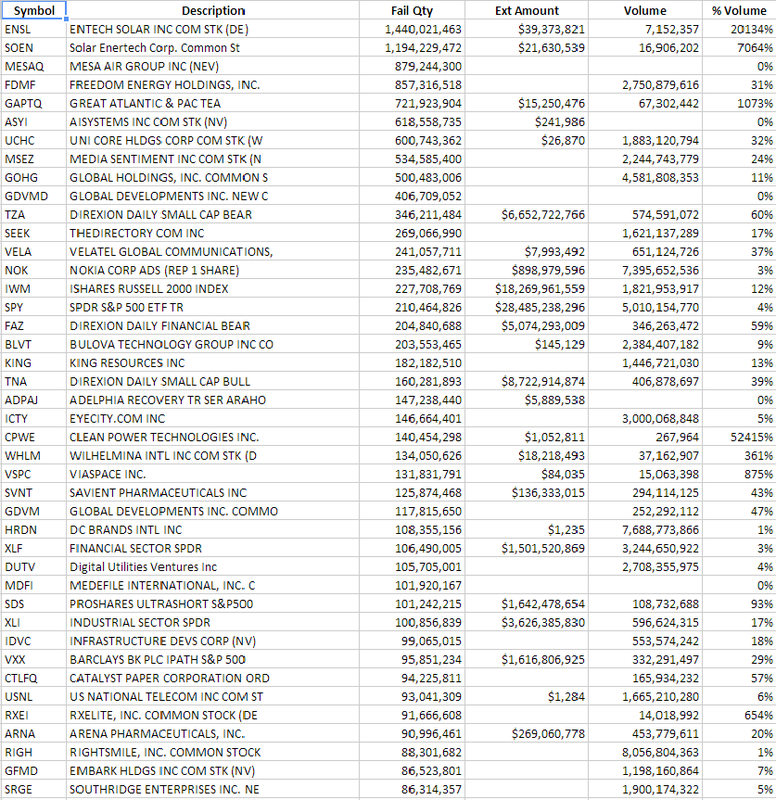 For many of these companies, the quantity of shares that failed to deliver where many multiples of the number of shares traded during the same time period. This indicates massive naked short selling as many brokerages where unable to find shares to borrow before the settlement date. The second table orders the data in descending order by the “Ext Amount” column.